A 1960’s pre-fab bungalow was demolished and a five bedroomed modern, luxury home was built in its place. 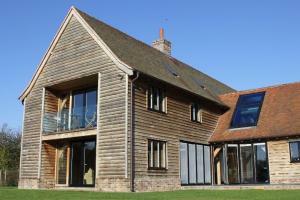 Part of the build was full masonry construction with the remainder constructed from timber. 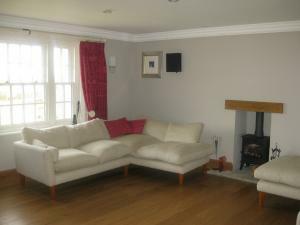 This particular house has many modern aspects to it but still maintains a family home feel. The oak canopy with knee braces is an unusual feature. Works included:- tiled floors throughout; underfloor heating; powder coated aluminium bespoke joinery; self-coloured render; acoustic roof insulation and decibel screed; high tech wiring system catering for modern living; and landscaping works. 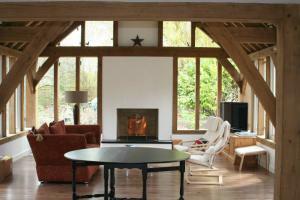 Construction of a beautiful oak timber framed, oak boarded house with the design emphasis on light and space. 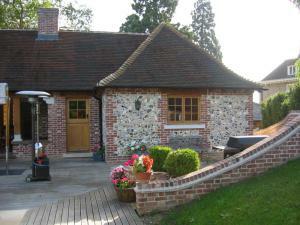 The original chalet bungalow was demolished leaving a large site for the construction of a new spacious family home. 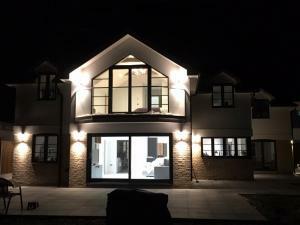 This project has some beautiful features both externally and internally including:- jetties to front and rear elevations and pentice boards with ornate gallows brackets; bespoke joinery; and a specialist lighting design. Demolition of existing chalet bungalow and erection of new building. Part of the building was built around a new bespoke oak framework which created beautiful detailing both to the interior and exterior of the property. Construction of new brick and flint building. Purpose made oak joinery throughout with Portland stone sub cills and corbel detail. The accommodation comprised of showers, kitchen and changing rooms. New India stone terrace/BBQ area incorporating hot tub.